My husband already had the white shirt, jeans, and black shoes. I made the belt with red fabric from Joann’s. His boots are black shoes with black fabric over them made from a tutorial on Finkbuilt called Make Boots for your Costume. My wig came from Party City, makeup from Ulta, earrings and necklace from Etsy, and purple shirt and corset from Amazon. My costume was modeled after another Ursula costume on this site. The 6 tentacles are made with 3 pieces of fabric, two black and 1 purple from Joann’s. I stuffed the first half of them with air cushions from Amazon boxes and the rest with stuffing. The tentacles were then sewn onto a piece of nylon webbing with a parachute clip. The “water” was made with two different shades of blue tulle from Joann’s. I didn’t get the look I was going for, but it still worked in hiding my legs. My daughter’s starfish hairclip is from Etsy and her beige shirt is from Amazon. The shell top was modeled after a shell bra for kids on Etsy. 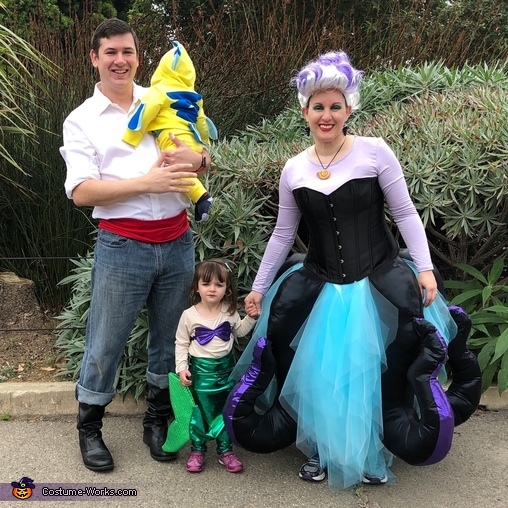 The mermaid tail was made from a tutorial on Make It Love It called DIY Mermaid Costume with a Repositionable Fin! I kept the leggings and tail separate, so it would be easier for her to move around. The shell bra and mermaid tail fabric were purchased at Joann’s. My son’s yellow zip sweatshirt and sweatpants were purchased from Primary.com. The mohawk, fins, stripes, and tail were made from felt from Joann’s. I looked online at pictures of Flounder and freehanded the shapes. I modeled his costume from a tutorial on Unoriginal Mom called DIY Little Mermaid and Flounder Costumes. The costumes took me months to work on, but I am very happy with how they turned out. We got a great reaction at work, the Halloween parade at the zoo, and during trick or treating.